Chris Kyle (Bradley Cooper) grew up with a very strict father. His father taught him to stick up for his family, but never become an aggressor. He also taught Chris how to hunt. As an adult, Chris had aspirations of becoming a cowboy, making frequent appearances at rodeos. When the American embassy in Tanzania was bombed, Chris decided to make a change. He enlisted and began training as a SEAL. After completing his training, Chris meets Taya (Sienna Miller) at a bar. After her sister’s experience being married to a SEAL, Taya had vowed she would never marry one herself. She and Chris begin dating and, just before he is about to get deployed after the September 11th attack, they get married. As a sniper, Chris’ duty is to protect the Marines going door to door in Iraq, searching the city for those who have not evacuated as directed. On his first tour, he finds himself in the difficult position of deciding whether possibly innocent civilians are a threat. He makes his first kill. As his tour continues, Chris earns the nickname of “The Legend,” due to his excellent sniper skills, racking up more kills than any other sniper. The only regret Chris has is when Marines are killed under his watch. Al Qaeda has their own expert marksman, Mustafa (Sammy Sheik) who was an Olympic champion. His skill rivals, if not beat Chris’ skill. When Chris’ tour ends, he returns home to his life. As with many who go to war, Chris has a hard time letting go of what he has seen. He is paranoid, eying everyone as a potential threat, jumping at the smallest noise. When Mustafa injures one of his fellow SEALs on his third tour, Chris becomes obsessed with catching him. When he returns home again, he is finding it even harder to return to civilian life. It is taking an impact on his family life. Taya doesn’t know who he is anymore. She tells Chris that if he goes for a fourth tour, she and their two children may not be there when he gets back. Chris signs up for another tour, despite Taya’s objection. There are more lives to be saved and he must stop Mustafa. 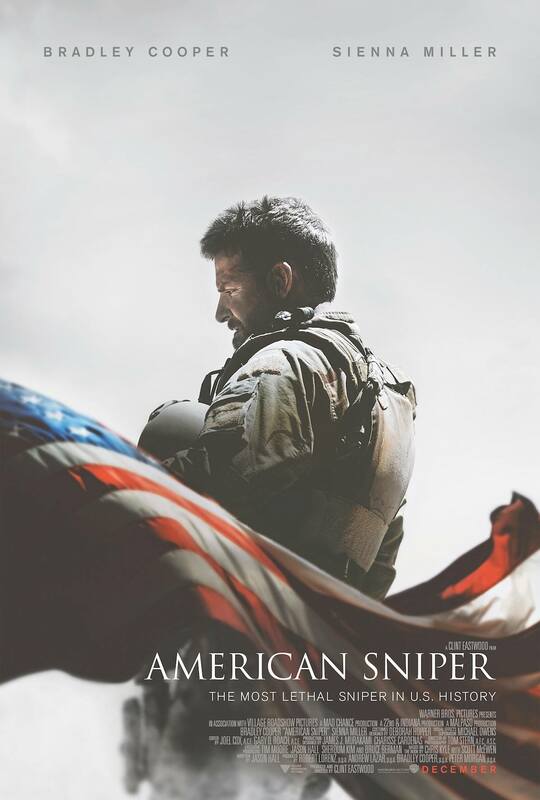 American Sniper is the true story of Chris Kyle, the most lethal sniper in American military history. His prowess as a sniper saved countless lives. The film shows the brutality of war. The unspeakable acts that some commit. And the dedication of the armed forces. More than this, though, the film showcases the difficulties of those serving our country when they return home. The film is well-deserving of its Best Picture nomination for this year’s Oscars. Clint Eastwood masterfully directs the film. Bradley Cooper is also deserving of his Best Actor nomination. While he looks like Bradley Cooper, everything about his performance is Chris Kyle. Even minor details, from his speech to the way he holds his lips puts him in the character. And he never steps out of it. His PTSD when he returns home is believable and doesn’t seem overdone. If you’ve heard anything about the film recently, you have probably heard about “Babygate.” After Chris’ second tour, he comes home to his newborn daughter. For some reason, the decision was made to use a fake baby. To make the baby seem more realistic, the special effects team uses CGI to move the baby’s arms and hands. When it isn’t done by CGI, you can see Cooper flicking the arm to make it move. It may be more noticeable since so much fuss has been made about the fake baby. Nonetheless, it is very distracting. Despite the fact that the film is over 2 hours long, the time passes quickly. The horrific acts portrayed in the film, though I’m sure some may have been slightly embellished for the movie, don’t feel gratuitous. As a whole, the film does a very good job showing the harsh realities of war and the toll it takes on those involved. Regardless of your stance on war, American Sniper is an excellent film detailing the life of one of our finest soldiers. It is worth watching to get a true look at the impact these wars have.